After my last post about ‘getting the scattered far field using ComsolRF module ‘ a bunch of problems appeared. Actually, the definition of the incident field, using a line of current is wrong. It prevent the PML to work nicely, and thus, the overall field (and of course the scattered field) will be wrong. To correct this behaviour, one should first start a problem by using the Scattered Formalism Equation Resolution. If you already have your setup, just go to Physics > Properties and change the Field Type to ‘Scattered xxxxx waves’ (where xxxxx is your polarization system : TE, TM or hybrid). 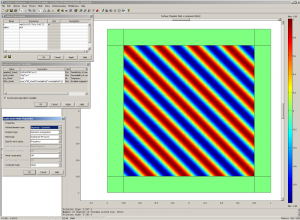 Now, instead of including a source inside your setup, Comsol will use a theoretical field that we have to define. With this formalism, no boundaries problem can appear again. First create your setup, and add your PML. As an exeternal boundary condition, choose Scattering Boundary Condition (and specify the type of field you want to use). For a regular geometry there is no difference with the initial condition (ie. Perfect Electrice Conductor), but I guess that differences could appear if your domain is a little bit tricky. - you have to define alpha \in (0, 2*pi), the angle of incidence in Options > Expressions > Global Expressions. - you have to define r = sqrt((x-xc)^2+(y-yc)^2), the center of your source in Options > Expressions > Global Expressions. - you have to define xc and yc, the coordinates of your source, in Options > Expressions > Global Expressions.